We are a leading Exporter of artificial saliva spray from Navi Mumbai, India. 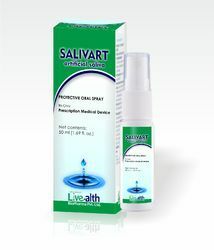 SALIVART Artificial Saliva spray is highly effective in relieving the symptoms of dry mouth caused by radiotherapy. Dry mouth, if left untreated, can become both painful and uncomfortable. It can also make eating much more difficult. Fortunately, SALIVART can help with this side effect. SALIVART comes in an easy-to-use spray form and is available in several refreshing, natural flavours. Simply spray into the mouth for 1-2 seconds as often as required or as directed by your healthcare professional. Packaging Details: 30 ml Spray Bottle In a printed Carton.